If you’re joining us from abroad, a very warm welcome to you from all of us here at NUCU! On top of all of our general events throughout the year we have some fantastic events especially for all of you international students. Please check them out, we’d love to welcome you to our family! The Chaplaincy hosts a series of events specifically for international students in the week before general Welcome Week (which starts 24th September this year). These events are from 19th-21st September. 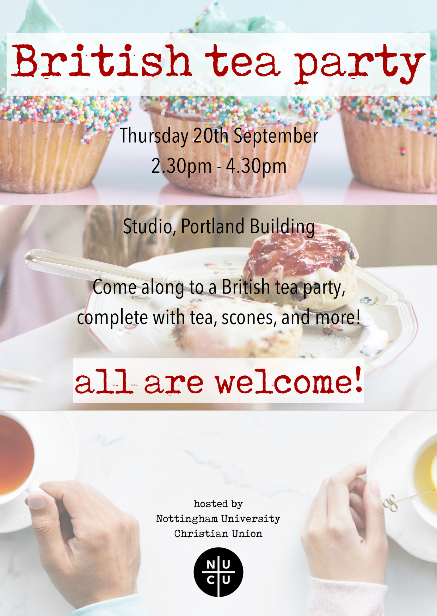 There’s a chance to have some classic British tea and to get to know other international students. You can also meet a UK student and find out more about what it’s like to live and study in the UK: everything from the weather to how to use public transport in the city. We have a slightly different event on the 20th at 2pm, hosted by the CU: a British tea party. As well as the usual tea and coffee there will be plenty of homemade cake and even some scones to try so please come along and share in a bit of British culture with us. All these events will be happening in the Studio in Portland Building. Globe Café is all about having fun, meeting people from different cultures and discussing some of the big questions of life while enjoying hot drinks and cakes. 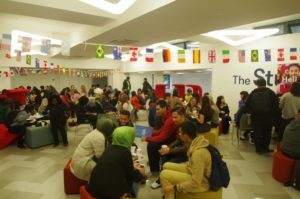 The cafés are a friendly place especially for international students and happen on Monday or Tuesday evenings every week during term time, at four different locations so that you can attend the one closest to where you live and study. Find out more about Globe Cafe, along with locations, on the Chaplaincy Website.